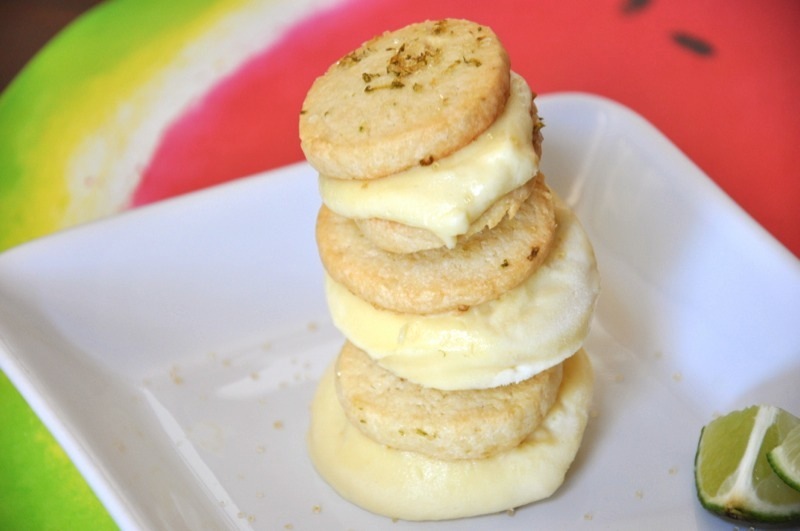 When I saw the Margarita Ice-Cream Sandwiches in the June 2011 Cooking Light I knew I had to make them before the summer was over. Ice cream sandwiches are a great way to end a summer party because they are easy to serve, easy to make ahead, and oh so cool in the hands and on the tongue. They are also whimsical and a bit reminiscent of our childhood, a theme that goes right along with summer. I was particularly inspired by these cookies because I had two jars of lime curd in my refrigerator and I was just sure the curd would be a great compliment to the cookies in place of the sherbet because I’m just not a big fan of sherbet. Happily I was right. Make the cookie dough and chill. You should plan about 30 minutes to make the dough and then at least 3 hours for it to chill. You could easily do this a few days in advance to help distribute the labor over a few days. Slice and bake the cookies. It takes about 30 minutes total to get the cookies onto pans and baked in the oven, a bit more if your short on oven space or cookie sheets. You’ll need to plan at least another hour for the cookies to cool completely. The cookies held beautifully for 3 days so I think it’s safe to make them at least a couple of days in advance of making the sandwiches. Assemble the sandwiches and freeze them until set. The sandwiches come together in about 15 minutes but then you’ll need to let them sit for another 4 hours before serving. Some quick math shows you really need to start making these cookies at least 9 hours before you plan to serve them. Given that, I’d recommend making the cookies on one day and assembling the sandwiches the next. I substituted local lime curd from confituras for the lime sherbet. The result was a creamier, subtler, and much less bright green filling. You can use store-bought lime or lemon curd, or make your own. Most of the reduced fat ice creams at my grocery store include ingredients I don’t recognize or don’t like to ingest (like corn syrup), so I substituted fat-free frozen yogurt for the reduced fat ice cream. I wanted to make slightly smaller sandwiches so I formed the dough into 2 cylinders that were about 1 1/2 inches in diameter and 9-10 inches long. I ended up with 48 cookies to make 24 sandwiches. Because I had more cookies I had to double the lime zest, sugar, and coarse salt mixture to 8 tsp. lime zest, 2 tsp. turbinado sugar, and 1 tsp. sea salt. My cookies took 13-14 minutes to bake instead of the 10 listed in the recipe. This isn’t surprising given variability in oven temperatures, baking sheets, and the like. Just be sure you don’t pull them out until they are starting to get lightly brown around the edges. To keep the cylinders of cookie dough round, slide them into paper towel tubes. If your cylinders are larger in diameter than the paper towel tubes, simply cut the tubes lengthwise and wrap them around the dough logs. You’ll have a gap at the top but you’ll still get the same support for keeping the cylinders round as the cookies set. To help the sandwich assembly move right along use a round disher (scoop) to dole out the ice cream. For my smaller cookies I used a #40 scoop. The lime curd is softer than sherbet would be, so when you combine it with softened ice cream (or yogurt in my case) the mixture will be a little too runny to scoop onto the cookies immediately without running every which way. To solve this issue simply put the mixture back into the freezer for up to an hour or until it’s hard enough to hold the scoop shape. I’d recommend making the yogurt/curd mixture as soon as the cookies come out of the oven, even if you’re making them the day before, so when you’re ready to assemble the cookies all of the pieces and parts are ready to go. As you might imagine you could swap lemon zest and juice for the lime in this recipe for a bright, summery dessert. You might mix a little fresh thyme into the zest, sugar, salt topping for a bit of an herbal note in the cookies. Strawberry ice cream would be a great partner to the lemon flavors. Orange would also work as the citrus component and would be fantastic with a chocolate ice cream filling. You can have a field day with ice cream flavors here. Coconut ice cream or sherbet would be great with the lime cookies and still keep the tropical inspiration going. It would be fun to start in the freezer section of our grocery store or even favorite ice cream shop and build the cookie flavors around whatever fun ice cream you find. The cookies from this dish are great on their own. If you don’t have the time to make the ice cream sandwiches, just make the cookies and serve them with scoops of your favorite ice cream.